This latest round of Test Kitchen brings us the dynamic duo of Steve Samson and Zach Pollack, whom most of us probably remember as the Executive Chef and Sous Chef at Pizzeria Ortica in Orange County. The pair met in 2006 while making the rounds in LA, and instantly bonded over their common love of Italian cookery. 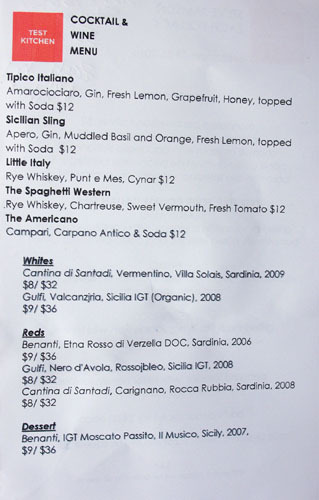 Samson was working at Sona at the time, and in January 2009, the two were tapped by owner David Myers to open Ortica near OC's South Coast Plaza. 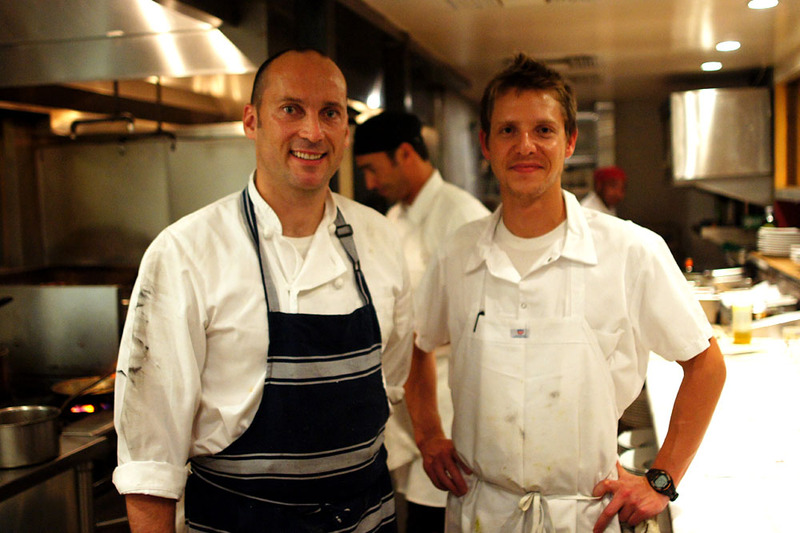 The two Chefs garnered considerable acclaim during their tenure there, but in the end, they still wanted their own place, and thus left the restaurant in May 2010. For Test Kitchen, Samson and Pollack are presenting a menu entitled Agli Isolani ("For the Islanders"), which, as the name implies, is inspired by the islands of Sardinia and Sicily. Sardinian cuisine is quite different from that of the rest of Italy, tending toward the rustic, a result of the island's isolation from the mainland. Seafood is also featured prominently. On the other hand, Sicilian fare has been inextricably influenced by the culinary traditions of foreign cultures, taking on North African, Spanish, Greek, and even Arab cues. The menu was priced at $44 for four individually plated courses, with a quintet of optional stuzzichini (snacks) to start with. Meanwhile, cocktails tonight were the charge of bartenders Brian Summers and Julian Cox. Click for larger versions. 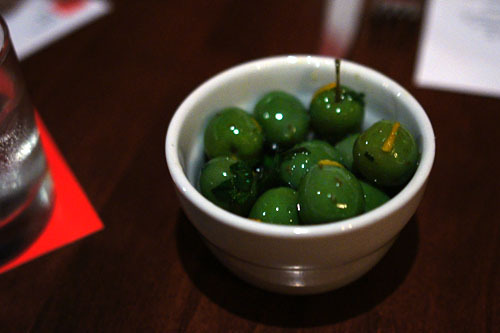 Our first stuzzichino was a bowl of Castelvetrano olives, a green varietal typically found in Italy (especially the town of Castelvetrano in Sicily). Marinated in an admixture of olive oil, chili, parsley, and mint, they showed off a savory tartness, augmented by the considerable weight of olive oil and nicely accented by the tangy sweetness of orange zest. These reminded me very much of the Castelvetranos at Ubuntu. 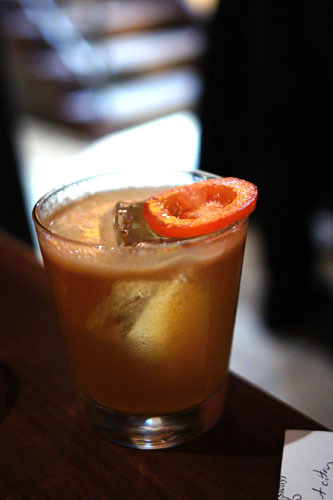 Our first cocktail was the Tipico Italiano, which demonstrated a fresh citrus nose leading to sweet, tart, herbal notes on the palate that beautifully countered the potency of the gin--very nice. 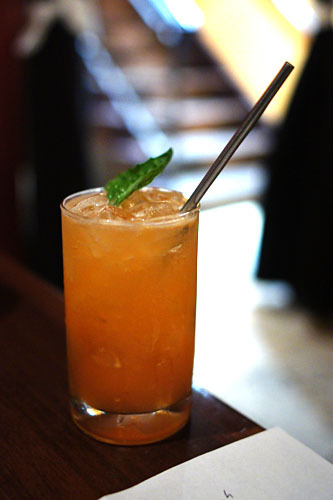 The Sicilian Sling was arguably even better, showing off delicious bittersweet citrus flavors balanced by an undercurrent of basil. Excellent. 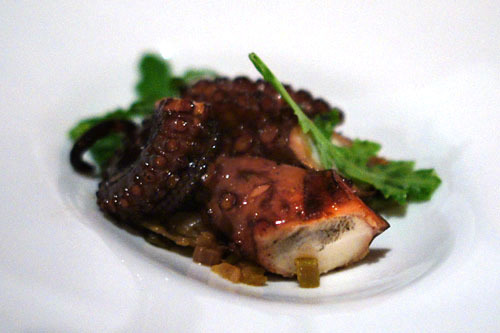 I've had some good experiences with octopus at Test Kitchen so far, and this was no exception. The cephalopod was cooked to a fantastically tender consistency, with a flavor that was beautifully complemented by a touch of bitter char. The key, though, was the caponata Siciliana (a sort of sweet & sour veggie salad typically made with eggplant), which provided a perfect vegetal counter to the octopod, finishing it with a slightly bitter twang. My favorite course of the night. A Sicilian specialty, panelle are basically chickpea flour fritters, and were served here with ragusano, a type of cow's milk cheese from the island. They possessed a simple savoriness, which was heightened by the gravity of the cheese and just a touch of spice. 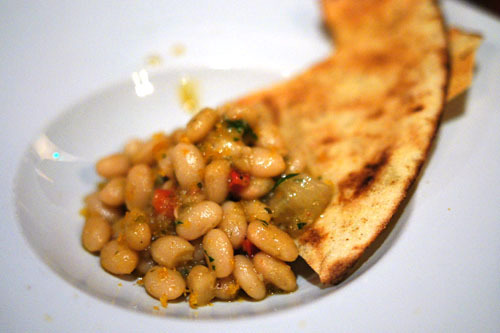 Pane guttiau refers to a type of Sardinian flatbread, served here with beans and bottarga (cured fish roe). I enjoyed the earthy weight of the white beans, and how they, in concert with the briny bottarga, heightened the relatively mild relish of the crispy sheets of dough. Quite nice. 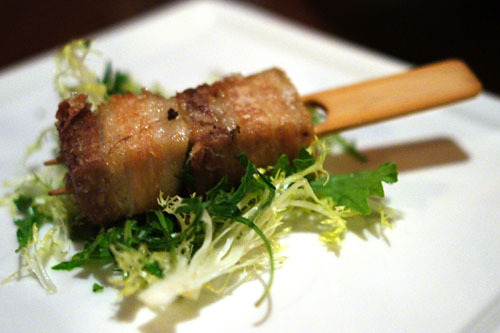 Another Sardinian staple, this was roasted pork belly, or, as I called it, a pork popsicle. It was everything that you'd expect, a rich, unctuous celebration of porcine sapor, deftly tempered by the application of myrtle and frisée. I wanted a bigger piece! And now, we get into the meal proper, starting with a presentation of mackerel picked out for the Chefs by none other than Kazunori Nozawa. 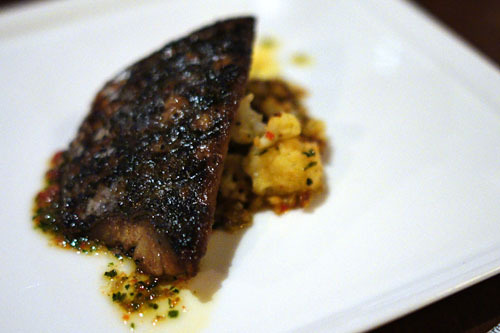 The mackerel itself was fabulously fishy, as it should be, with a great touch of acidity due to its scapece (a.k.a. escabeche) marinade of oil and vinegar. 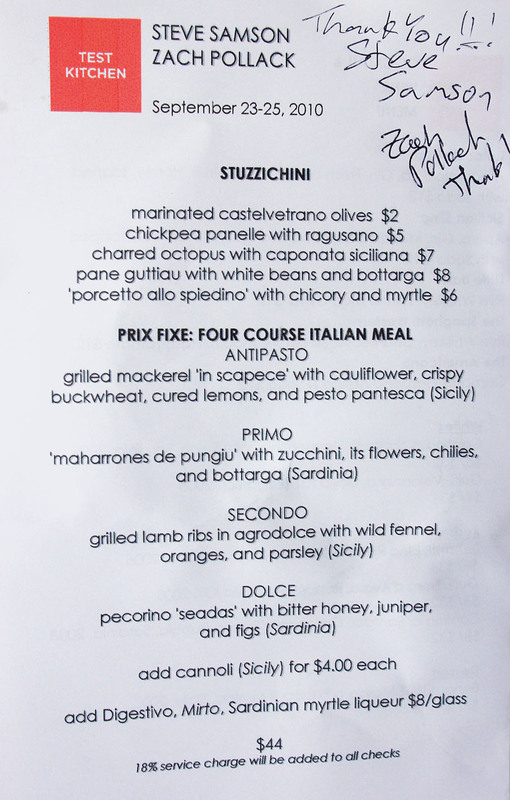 At the same time, it was expertly moderated by its accoutrements, with the tartish pesto pantesca (basil, capers, tomato) being particularly apt. A table favorite. The Chefs painstakingly hand rolled and grated a whopping 5,000 pieces of maharrones (I'd never heard of it either) for this dinner series. 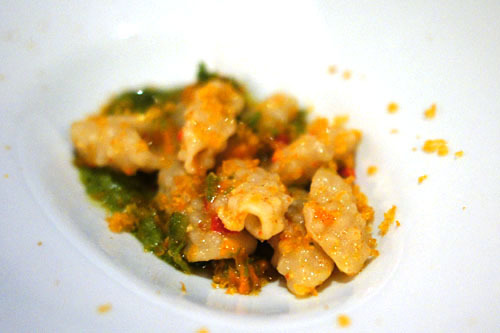 It was a dense, chewy pasta with a nice doughiness. I really appreciated the creeping, lingering spice in this dish, and how it was moderated by the light, vegetal tang of zucchini, mint, and basil. 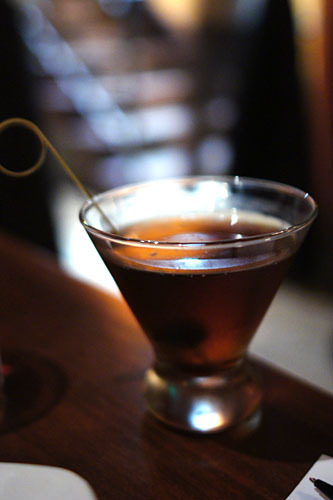 The Little Italy was described by our server as an "Italian Manhattan," and she was spot on. 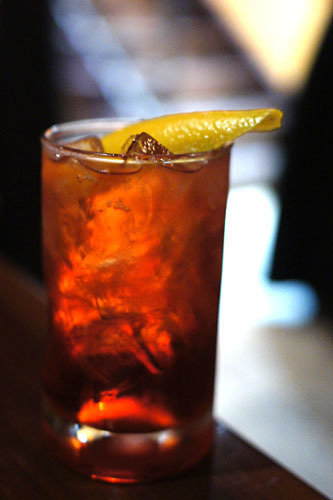 I rather liked the bitterness contributed by the Punt e Mes vermouth, as well as the sweet-herbaceous notes of the Cynar. 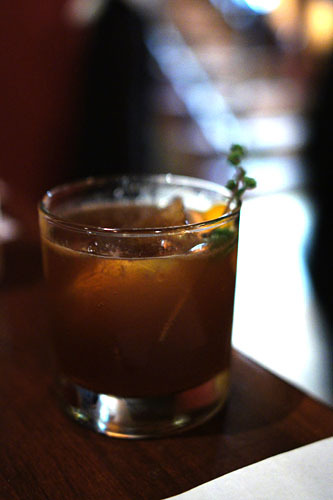 The Spaghetti Western, on the other hand, was like nothing that I'd ever drunk before, a viscous, gritty libation with marked flavors of tomato counterbalanced by the pungent tang of Chartreuse. 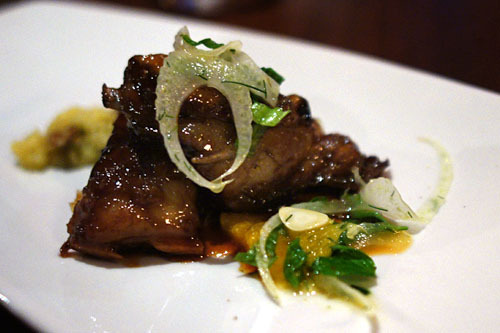 For our final savory of the evening, we were served ribs of lamb, bathed in an agrodolce (a sweet & sour sauce) dressing. The ribs were undeniably savory and unabashedly fatty, with a nice bit of char. However, I found the agrodolce a touch sugary, so I really appreciated the refreshing smack of the fennel and orange, as well as the moderating base of the superb mashed fingerling potatoes. Our last cocktail of the night, the Americano, was one of the better versions that I've had, with a great, lemon-y aroma and a lovely effervescent bitterness, tinged by a touch of sweetness. 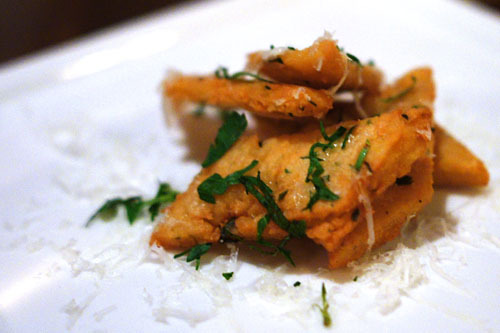 Seadas are a type of Sardinian fried cheese pastry, originally served as a savory course. 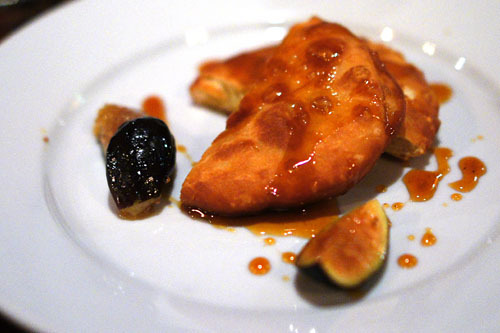 Filled with Pecorino, the half moons were nicely salty, but this savoriness was expertly balanced by the bittersweet honey, while the figs provided some fruity overtones to the dish. 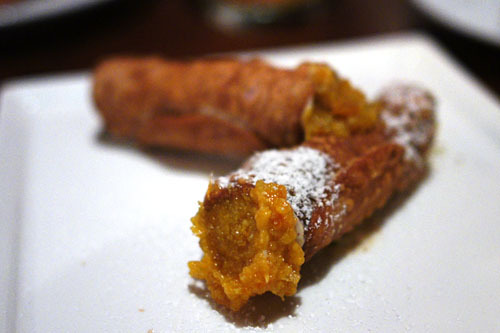 Perhaps the most popular export of Siciliy, cannoli are basically tubes of fried dough, stuffed with a sweet ricotta filling, and, in this case, further flavored with pistachio, orange, and chocolate. This was perhaps the best version of the dessert that I'd ever had, with a great interplay between the chocolate and orange, all with an overarching trace of nuttiness. Chefs Steve Samson and Zach Pollack. I've oft been criticized for my slight indifference toward Italian cuisine, but meals like this are definitely helping me turn over a new leaf. It was great to be able to taste some island specialties that don't make it on to most menus; I think that regionalness is absolutely key for me when it comes to appreciating Italian, and these guys are right on the money. Currently, Samson and Pollack are working on opening an Italian eatery here in Los Angeles, one that'll focus on Southern Italian cuisine, as well as Neopolitan-style pizzas. My interested has definitely been piqued. Previous Test Kitchen posts: Joshua Smith (9/21), Amy Pressman (9/20), Shelley Cooper (9/17), John Sedlar (9/15), Amanda Baumgarten - Dylan Hallas - Dan Moody (9/14), TiGeorges Laguerre (9/6), Vartan Abgaryan (9/4), Neal Fraser (8/31), Michael Voltaggio (8/29), Walter Manzke (8/25), Ricardo Zarate (8/24), Jordan Kahn (8/18). I think a lot of foodies have little interest in Italian, because it's so often overdone. You can go into just about any "American" restaurant and the cook will throw together noodles and sauce and call it spaghetti. I agree that regional uniqueness can really change a dish. Most Italian restaurants in Los Angeles are overpriced and underwhelming, but Samson and Pollack won't fit that mold when they open their restaurant. They made the best pizza in Southern California while they were at Pizzeria Ortica, and I imagine that will still be the case. You pix turns out great despite the poor lighting!! I'm impressed by your camera! This is the one I most wanted to attend, but unfortunately couldn't! Glad you enjoyed. The first comments regarding Italian come off so ignorant. Sara my dear, you may want to bump up your choices to the Olive Garden. GPS I think you can say that about most restaurants. Most Italian is actually the better bargains, pastas for $20. Most foodies have a select group of restaurants within each cuisine that they would go back to. I really wanted to make this Test Kitchen set, and it looks like I really missed out. Thanks for the food envy Kevin, which is being heightened by the fact I am stuck at Columbus Airport and starving! The pasta was terrible - salty, doughy, and dense. However, maybe some people like that so I can give that a pass. But the bitter pungent "dessert" was a cacophony of flavors that clashed horribly on the palate. The twinge of sweetness was not enough to offset the bitterness that was, frankly, reminiscent of bile. However, the lamb ribs were near perfection. 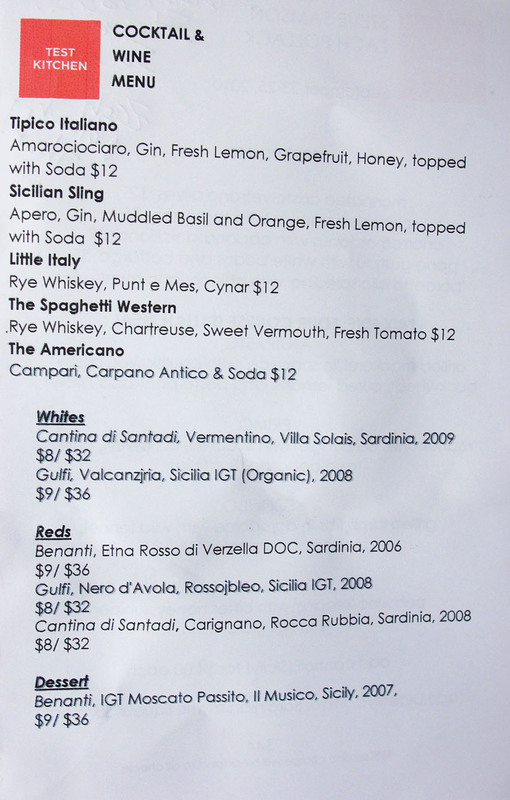 And the drinks were amazing. So it almost makes up for the pasta and the dessert. Sara: The bastardization of Italian cuisine, then, yes. Josh: I hope you're right. It'll be interesting to see how their new place stacks up against what they did at Ortica. Sam: It's not so much the camera, but the skills! Jai: Even more than Dylan's? Komal: Why are you in Columbus??? Anon: I actually didn't mind the doughiness of the pasta. But yes, the dessert was a bit discordant, though not ineffective. Interestingly, if I had to pick my weakest course, the lamb would be it. Different strokes for different folks I guess. Apparently it was Cleveland I was stuck in, in my defense I was really sleep deprived. I was there though because I was heading to Rochester and had to stop in Cleveland since there were no direct flights. And why were you headed in that direction to begin with? A wedding reception! Two dear friends finally tied the knot!